The general never mentioned the order in his Personal Memoirs. His wife, however, was not so reticent. She called it "obnoxious" and in her memoirs declared that "he had no right to make an order against any special sect." The order was General Order 11, issued by Major General Ulysses S. Grant on Dec. 17, 1862. The "special sect" referred to by his wife, Julia Dent Grant, was the Jews living within the military department commanded by her husband. In what has been described as the most anti-Semitic government document ever issued in America, the Union's most successful field commander and future president of the United States declared that all Jews "are hereby expelled from the department within twenty-four hours from the receipt of this order." The order also explained the reasoning behind Grant's edict. "The Jews, as a class," the order read, were "violating every regulation of trade established by the Treasury Department." Although the order was ordered quickly and quietly rescinded by President Lincoln and directly affected only a small number of Jews in Kentucky and Tennessee, its brief and tumultuous life energized the Jewish community throughout the North and came back to haunt Grant during his run for the presidency in 1868. The story is told with scholarly analysis and in a clear, concise narrative style by Jonathan D. Sarna, a professor at Brandies University and chief historian of the National Museum of American Jewish History. Sarna recounts the first life of the order in a concise 50 pages. His retelling of Paducah, KY merchant Cesar Kaskel's odyssey to Washington, DC to inform President Lincoln of the injustice being done to a group of loyal citizens judiciously balances a few facts and a bounty of apocrypha that surrounds this impromptu White House call. What's known for sure is that Lincoln quickly ordered Henry Halleck, general-in-chief of the armies, to countermand the order. Choosing his words carefully, Halleck ordered that "if such an order has been issued, it will be immediately revoked." On Jan.6, 1863, just a few days after the Emancipation Proclamation took effect, Grant revoked his ill conceived directive. But why did Grant issue it in the first place? Unless he was a religious and cultural bigot, which he wasn't, there must have been forces beyond his control that pushed him into action. While it's hard to discern what goes on in a person's mind, Sarna investigates several possible motives, including the involvement of Grant's father, Jesse, in a speculative and possibly illegal scheme to trade in valuable contraband cotton. 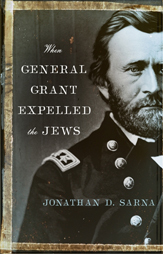 Grant's relationship with his father was always complicated and the fact that his father's partners were Jewish probably exacerbated the general's frustration. But it was what the order implied rather than what it did that really caused alarm throughout the Jewish community. "Fault for many of the other evils inevitably associated with war --" Sarna explains, "smuggling, speculating, price gouging, swindling, and producing 'shoddy merchandise for the military – was similarly laid upon the doorstep of 'the Jews.'" Singling out Jews "as a class" rekindled memories of centuries of persecution and Jewish organizations throughout the North were galvanized into action as never before. The story now shifts to 1868 when Grant became the Republican nominee for president. As an overwhelmingly favorite to win, his opponents looked for anything that could damage him. General Order 11 was resurrected and again became a hot button issue. Grant weathered this storm, too. In fact, Sarna asserts, that "Having apologized for his anti-Jewish order in 1868, he became highly sensitive, even hypersensitive, to Jewish concerns." Sarna points out that Grant "appointed more Jews to public office than any of his predecessors. He sought to bring Jews (as well as Blacks) into the mainstream of American political life. He acted to promote human rights for Jews around the world." For a man who did so much to atone for one hasty, ill conceived, order issued under the stress of significant military and administrative responsibilities, it is probably best that he never knew that the tomb in which he and his wife rest, on Riverside Drive in New York City, was modeled after the mausoleum of the Roman emperor Hadrian, the same emperor who brutally put down the Jewish revolt against Rome and killed Jews by the thousands. Even great men can do little to escape the ironies of history.